This might tickle your fancy. I’m writing from Karkhana, a makerspace in Kathmandu. We are just about getting done with our biggest festival, Dasai, which celebrates the story of one of the two big Hindu epics, Ramayana. It’s a 10 day festival that pretty much brings the country to a complete halt as attention shifts to home, family, playing cards and chowing down on goat. On the 9th day of festival is a special puja called the “Astra” puja, i.e a worship of implements. The army worships their guns and helicopters. The taxi drivers worship their engines. And we got a Brahmin priest to conduct the ceremony for our 3d printer, our tables saws, our soldering irons, and, of course, our Raspberry Pi’s. Some photos are attached. Enjoy! RaspberryPi – refreshes the parts other computers cannot reach! 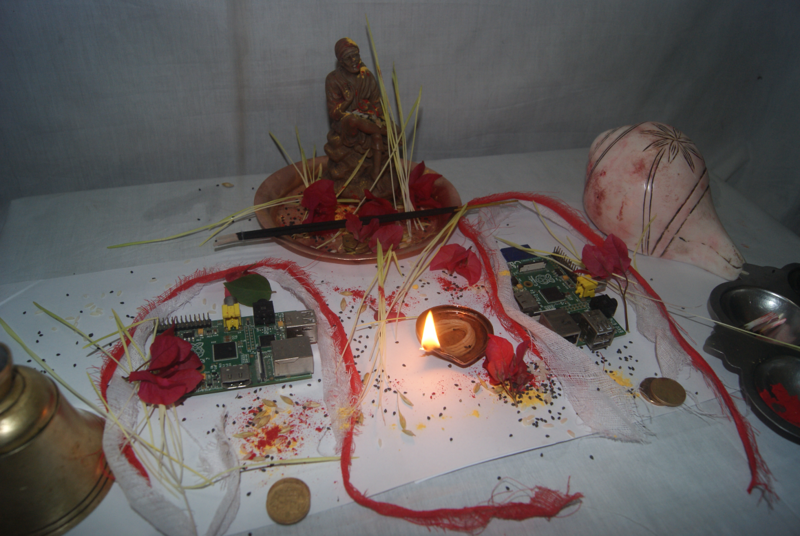 It is not worshiping Raspberry Pi, it is respecting and treating every object which a person depend on in his daily life. It is more logical to treat and respect the inanimate objects you daily depend on than praying to a imaginary gods or dead people. And yes Bill Gates is real God for majority of developing countries. Yes, I suspect us Westerners have lost sight of the origins of the word “worship”. It comes from “worth”, and suffix “-ship”. i.e. acknowledgement of worthiness (value). Whether worshipping animate or imaginary gods/objects, the net effect is the same. You induce self-hypnosis and feel much better about your worship thanks to the placebo effect. This can’t be any worse than what Apple devotees have been doing for decades, and now their holy man has potentially ascended (or descended, depending on your perspective) to somewhere/something that’s ironically very much in the spirit of what Ramayana is apparently about. He would have probably admired the blessing of Pii and certainly understood it, given his pilgrimage to that part of the world to experience Being Different at a very formative stage in his life. The only things I know about Nepal I learnt from Kim Stanley Robinson’s Escape from Kathmandu, and I’m not sure how accurate it is. But the hills there seem to make the Lake District look like Holland. Isn’t it about preparing to meet your Maker? “Aayudha” puja or “Astra” puja is performed so that no harm is done by the inanimate instruments that we use in our daily life. That’s why vehicles, hardware tools and all sorts of equipment and appliances in the house are included in the list. RPi is no exception for people who like and use it.. 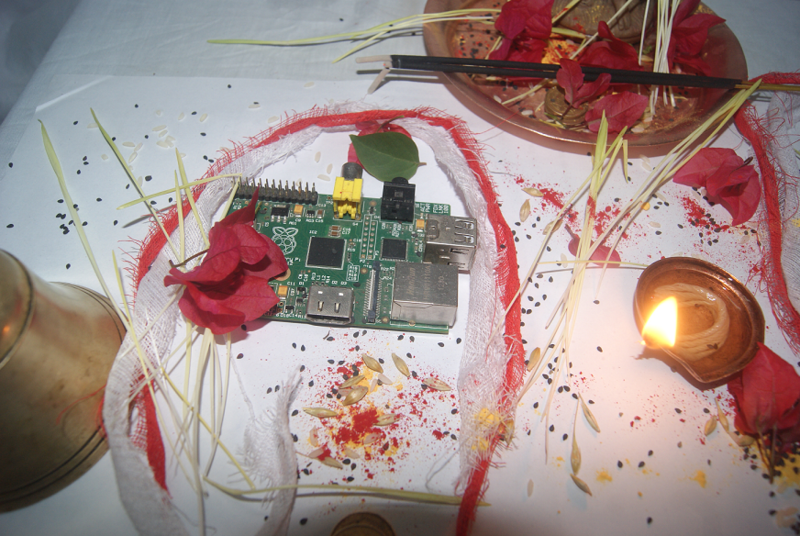 Here in nepal, we have been doing great in the field of DIYing and electronics, and special thanks to Raspberry pi, and arduino (I didn’t say it, ;) ) . Anyways, we hindus worship our tools and goods because we respect them. Cheers. Infrared camera – you asked us, so we’re making them!